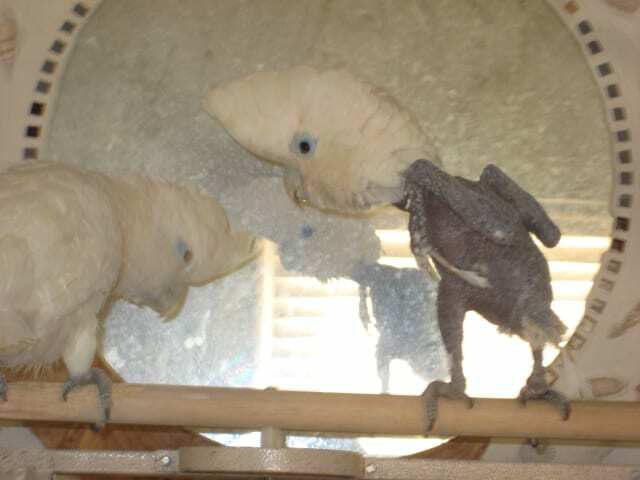 Home Bird Care Mirror mirror on the wall………. Well, Miss Bitsy, we here at M.A.R.S., our Florida parrot rescue, are about to try some brand new Harrisons Heal products to see if we can help improve your image. We will be using two products, Soother a topical spray, along with Bird Builder a dietary supplement. With the use of these products along with fresh air and sunshine, and some other additions to Bitsys’ daily routine we will hope to see marked improvement in what would other wise seem a lost cause. Follow Bitsys’ progress with us, sign up for our feed on www.marsparrots.org , and follow us on Facebook, Florida Parrot Rescue M.A.R.S.. Please if you can consider a donation to our cause to help purchase the products needed to continue the rehabilitation process of birds like our Bitsy. How is Bitsy doing? Any improvement? The vet at Crow River Animal Hospital was treating a different pet when the client’s bird made it clear it wanted treatment too. The vet was using an essential oil spray and they started seeing the bird’s medical issues heal as a result. Hope you will check it out! God Bless you all! Still a long way from feathering Bitsy. Perhaps you can get the vet to send us the recomended product and we will faithfully use it on Bitsy. Thank-you for caring.